In 2011, Amanda (Teachout) Riccardo was a licensed cosmetologist working in a Destiny USA hair salon. While chatting with one of her clients, Amanda received a piece of information that would redirect her career and turn her life in a new direction. The client was Mary Pagan, a former student advisor at University College (UC), the home of part-time studies at Syracuse University. She told Amanda about the Arthur O. Eve Higher Education Opportunity Program (HEOP)—the only program of it’s kind in New York State that serves part-time students. HEOP provides financial aid and academic assistance for educationally disadvantaged students who want to earn a college degree. 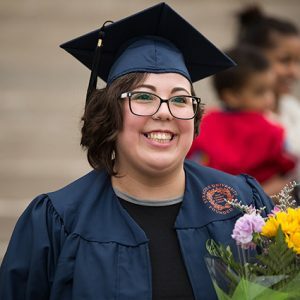 Amanda was just 21 when she heard about the program, and since HEOP is geared toward adults 24 and over, she delayed her application for three years. “It was worth the wait!” she exclaims. Even the challenges she experienced as a first-time college student didn’t deter her or diminish her enthusiasm. As an English and Textual Studies major with an affinity for creative writing, Amanda felt left behind academically at the beginning of her educational journey. “A lot of students have read books that I never read in high school,” she says, “but I’ve surprised myself by how much I enjoy learning new things. I only work two days a week while I’m in school so I can focus on my grades and my health. Even though I wasn’t the best student in high school, I’ve made the dean’s list most of my semesters at SU.” Her diligence paid off when she reached an important milestone in May 2017—Amanda was awarded her Syracuse University associate degree.